Coachman’s VIP range has long been the choice of those who enjoy touring in comfort and appreciate the excellence of its build quality. But, according to Practical Caravan's review team, a couple of things detracted from it. First, there was no Alde wet central heating, which is usually a given in this market, and second, it lacked a transverse island-bed model, a layout that already sells well for the VIP’s key rivals. 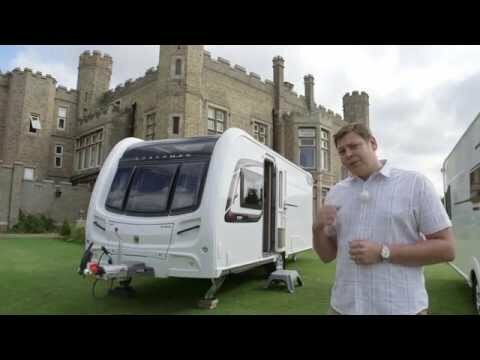 The 2015 Coachman VIP 575/4 addresses both points. It’s the first single-axle Coachman with Alde heating, and the end-washroom, island-bed floorplan puts it back in competition with comparable single-axle ranges from other manufacturers. We like the look of the Coachman VIP 575/4’s impressive buttressed frontal aspect – though the two sides are rather mismatched, with bags of glazing on the offside and a largely blank white wall aft of the forward door on the nearside. The walls feature fully bonded polyurethane construction and are finished with new graphics. The rather desirable kit list includes an AKS hitch stabiliser, ATC anti-snaking control, Al-Ko wheel locks, a gas barbecue point and an external 230V socket. The Coachman VIP 575/4 has room for four in its lounge, but not more, noted the Practical Caravan reviewers. That island bed steals lounge space, so the sofas feel quite short. However, that is one of the few disadvantages here. The matt-finish wallboard, upholstery and flooring look more contemporary than those in earlier VIPs. This one is lovely and light, thanks to generous glazing and a large sunroof. The freestanding lounge table, for use when the front chest’s pull-out table is too small, has dedicated stowage in the kitchen. The modern feel of the Coachman VIP 575/4 continues in the kitchen, with a striped splashback and speckled worktops. Even the draining board is a ‘designer’ item. But it’s far from style over substance: there’s an Omnivent, a dual-fuel hob, and a separate oven and grill. There’s even a radiator here, one of seven in the caravan – making it a good van for caravan holidays all year round. There’s a large additional food preparation area on the nearside above the fridge/freezer and beneath the microwave, which lives in its own (rather high) cupboard. Attractive LED mood lighting beneath the worktops really adds a sense of luxury. Lift the cushion beneath the island bed's pillows, push in the base, and you have good access to the Coachman VIP 575/4's washroom via a sliding door. That generous bedroom deserves a good bathroom, and the 575 doesn’t disappoint. The new-for-2015 shower cubicle is enormous, and features useful shelves. There’s convenient storage in the rest of the spacious washroom, which has an expensive, upmarket feel, thanks to details such as the backlit mirror. It’s marred only by the rather meagre heated towel rail. The Coachman VIP 575/4's transverse island bed – the first by the manufacturer – is 6ft 2in long when extended, and unobtrusive when pushed back during the day. It’s comfortable, too; all models get Ozio three-layer mattresses and cushions for 2015; they weigh up to 30% less than sprung types and are hypoallergenic. On the other side of the fabric screen, the double bed formed by the lounge cushions is perfectly usable. It’s not the widest we’ve come across, but it’s only likely to be used for guests. Our review team members were pleased with the many storage options in the Coachman VIP 575/4, from the vast area beneath the island bed (accessible from the outside) to the ‘his-and-hers’ wardrobes on either side of it. In the lounge, putting the fuse box beneath the offside bench seat makes the front chest a genuinely useful storage area. There are no ‘soft-close’ runners or catches, but nothing clangs shut; it’s just a shame the aircraft lockers have no proper positive catches. Throughout the Practical Caravan Coachman VIP 575/4 review, our team was impressed by the fit and finish of this new caravan. There's a real solidity that traditionalists will appreciate, a layout the market has been waiting for, and it feels like Coachman took a considered approach to designing and constructing this tourer. The VIP range is aimed at those looking for something special for their caravan holidays – and in the 575/4 they may well find it.